Black and White photography is a timeless genre. In the digital age, it's now simple to convert your images to black and white in post processing. But you also need to learn how to “see” in black and white and get the post processing right. In this issue's masterclass we look at exactly how to identify a great black and white scene, and how to effectively convert and process your images in black and white in Photoshop. In our expert guide, you'll learn all the factors involved in producing the highest quality images possible, and you'll discover how to add shine, color & volume to hair in a great Photoshop video tutorial. 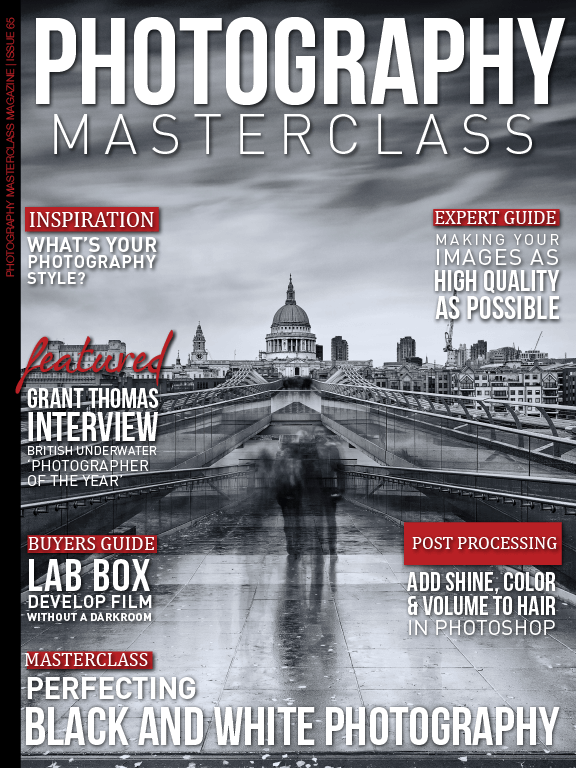 We also being you an in-depth interview with British Underwater Photographer of the Year, Grant Thomas, and you'll get the lowdown on the Lab Box – the easiest and quickest tool to develop your own films in full day light, without the need for a darkroom.